This mother-daughter team (Annette and Jaida) are in my beginning watercolor class. They are proudly showing the roses painted last week. This is the Jaida’s very first watercolor painting. I think they both did a beautiful job! To get updates on my classes please click the Newsletter tab at the top of this page. New classes are happening this fall. I have been teaching again…and loving it! This is a little demonstration piece I did today for a beginning student. 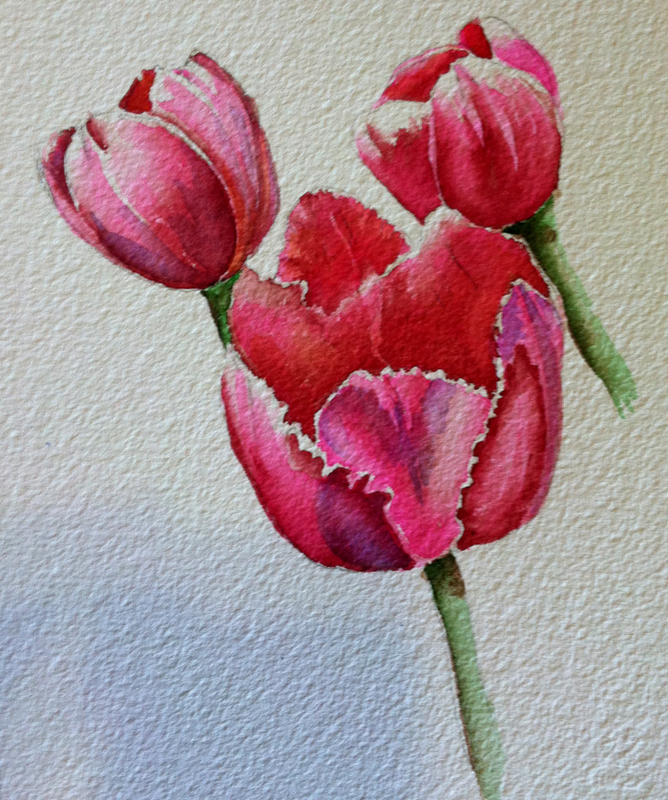 We are working on a small painting with about five tulips, but I demonstrated the brushwork on this extra little piece. The main focus today was to look at value and shape, then using the brush and pigments to create crisp and soft edges in watercolor to describe those shapes and values. Glazing colors is what adds so much depth to the painting. We started with one color, Permanent Alizarin Crimson, to paint the shadow areas. Then we glazed on several colors to enhance shapes in the painting. Cool colors were used in shadow areas, and warm colors were used in lighter areas and in areas where the shadows needed a warmer tone. 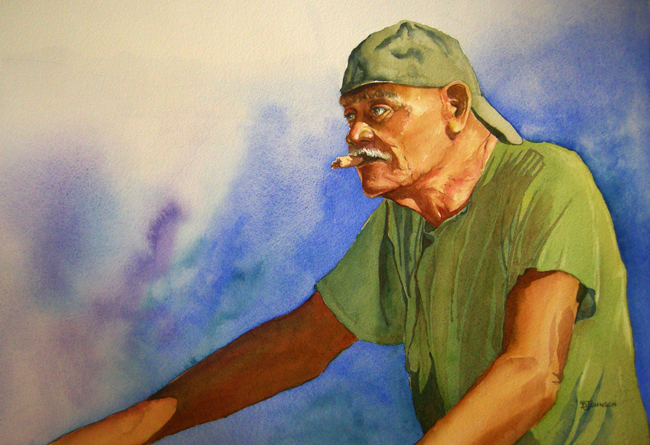 You can view some of my Youtube videos by clicking the Lessons In Watercolor tab at the top of this page. There I list video links, blog lessons, and how-to-paint books which I have on Amazon. Local classes start on June 25th if you are interested please visit the Classes and Workshops Link at the top of the page and contact me for more information. Ok, I think I’m nearly done. 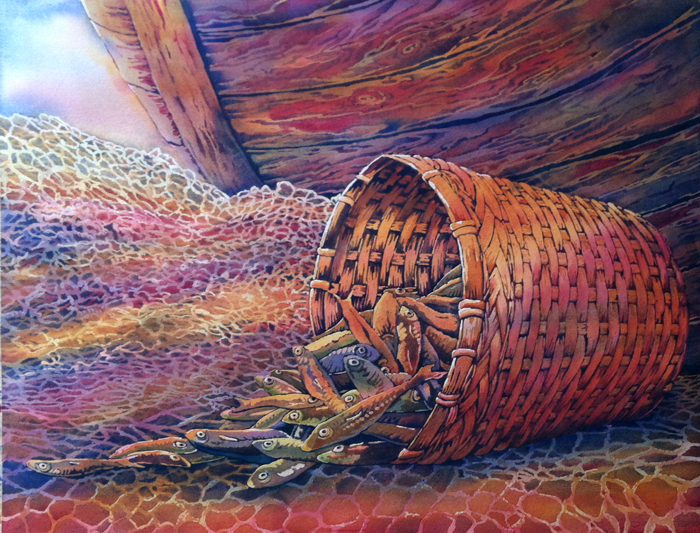 I softened the netting, darkened the boat, and worked on some glazing and details of the fish and basket (my focal area). If you saw my last post you can make a comparison to see some of the work I did in the past few days to get this painting closer to completion. I am quite happy with the cheery colors that are happening in the basket. Even the fish colors are blending nicely and still keeping their fishy-shape. This painting will be displayed at a local church in the West Melbourne area later this spring. I hope you have enjoyed the journey with me. I would love to hear your comments. Thanks for stopping by. 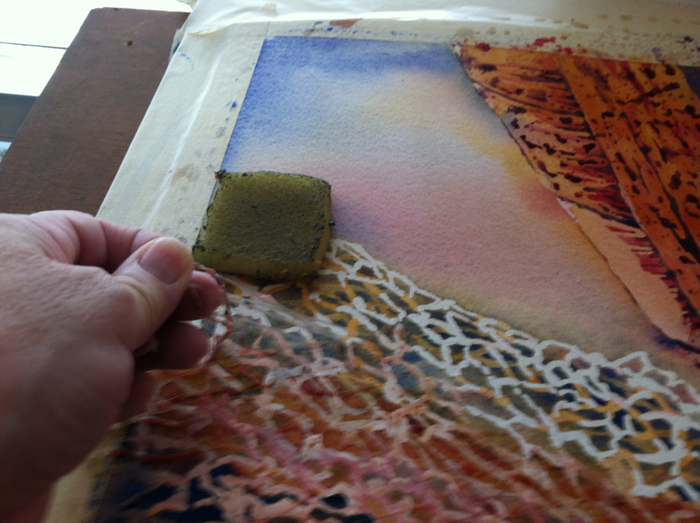 I used a masking pick-up tool to pull up the dried masking fluid from my painting. (See previous posts on the earlier progress of this painting.) It took quite a while to loosen and pull up the masking. This painting is large, a full sheet, 23 by 30 inches. Since I painted over 5 layers, and each layer has a new application of masking, there was a lot to remove. The work was worth the effort though and I am pretty happy with all of the beautiful textured results. 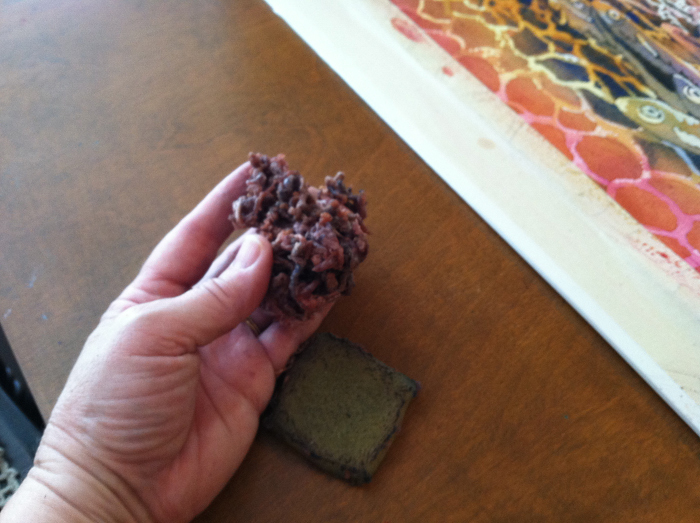 Here is the chunk of masking that I pulled from the painting. By the way, the only good tool to use to remove the masking is a masking fluid pick-up tool. It is similar to a rubber eraser, but it will not smear the pigments on the paper. The dried masking fluid sticks to it beautifully. I usually get an edge up with the tool, then gently pull with my fingers. Avoid rubbing the painting with your fingers as you have oils on your hands that will get into the paper. I find that when I use the masking pick-up tool I can be relatively aggressive with it. I rub it all over the painting, especially after most of the masking is removed. It will pick up any little leftover bits that are left behind. It is important to remove ALL masking from the painting. Now I am ready to evaluate the painting. 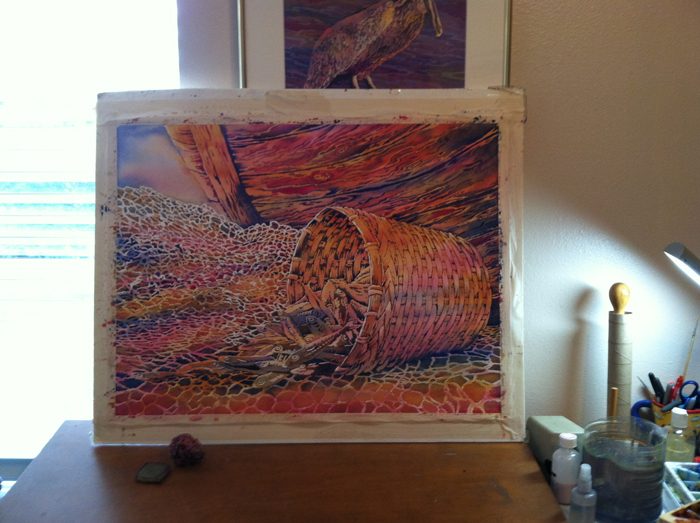 I can see I need to diminish some of the textures in the netting and darken the boat so that the basket will become more of the focal point. It isn’t finished yet! I’ll post another update soon. I have been working on a commission painting but I almost always work on more than one piece at a time. I just finished this piece today and have uploaded it to my etsy shop. It is 12 by 14 inches, framed, and is currently for sale. 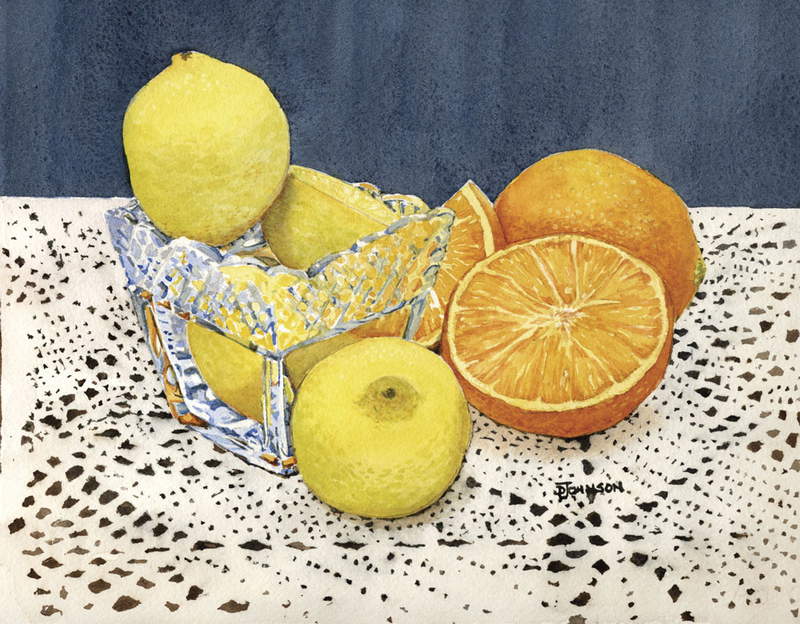 I have to admit I really enjoyed painting the oranges and the glass in this one! I hope you enjoy this one. I would love to hear your comments. If you would like to purchase this piece please visit my etsy shop. I have many items to choose from and several that would make great Mother’s Day gifts! Congratulations, Jaimie — and Clifton!!! Just eleven more days to the book release! “Clifton Chase and the Arrow of Light” will be available for sale/shipping in just a short while. You can pre-order your copy from Amazon.com. I created the cover and the chapter illustrations. Such a fun project. I hope that you will order a copy of the book, by author Jaimie Engle, and see for yourself what a delightful story this is! 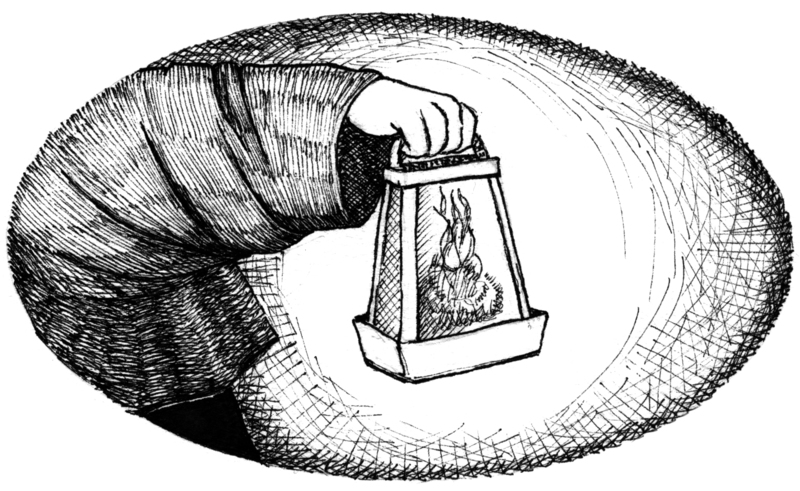 Sneak Peek: Chapter Two “Clifton Chase and the Arrow of Light”. 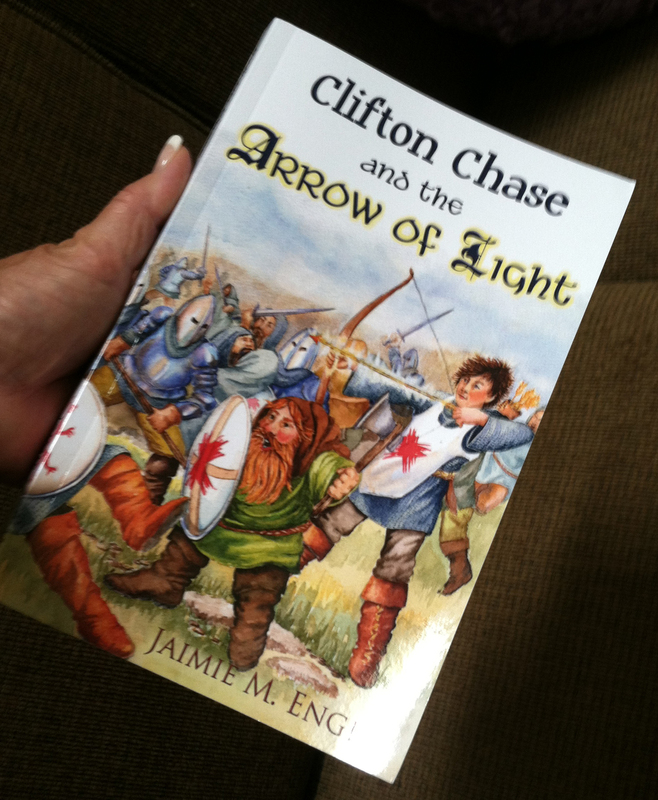 Local writer, Jaimie Engle, author of “Clifton Chase and the Arrow of Light”, published by Wayman Publishing, is featured in an article in Florida Today’s paper. Pick up a copy today or read the article here. 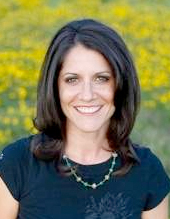 Jaimie is a mom, an award winning, published author, tutor for home school children and college students, provider of critique services for writers, and she continues to work on new manuscripts for publications. Jaimie was also featured in an international interview which you can see here. Her new book, “Clifton Chase and the Arrow of Light”, which I had the privilege to illustrate, will be launched on September 1st. Be sure to stay tuned to learn how you can pick up a copy! If you have middle grade readers in your life, this is a book they will thoroughly enjoy! This historical fiction piece is full of adventure, fantasy, and humor. Her characters are rich with life and personality. You have a chance to obtain a free copy by entering the publisher’s giveaway contest. Click here for details. Hurry, contest ends September 1st! Last, but not least, here is a sneak peek at the first chapter!!! Click here to begin your adventure!